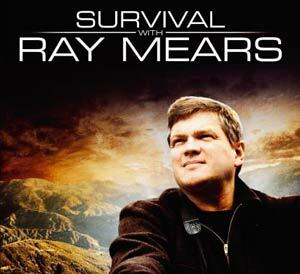 The third and final episode of Ray’s latest series, Survival with Ray Mears, will be aired this Sunday 2nd May at 19:00 on ITV1. You can pre-order your copy of the Survival with Ray Mears DVD from Woodlore now. In this final episode, Ray and his wildlife crew of Shane Moore and Isaac Babcock turn their attentions to tracking wolves in Idaho’s stunning Sawtooth Mountains. Several wild wolf packs roam this vast and breathtaking wilderness; however, Ray has just ten days to track them before they are taken off the state’s endangered species list, where they could then be hunted. Wolves are notoriously secretive animals, which makes searching for them extremely difficult. It takes all of Ray’s unique skills as a tracker to even get close to a sighting. Based at a rustic lodge in the town of Stanley, Ray begins his quest by hiking into the small river valleys that drain into the crystal clear Salmon River. It’s tough terrain, and at 7,000 feet above sea level, the winter’s snows are just retreating above the valleys. Ray’s tracking soon leads him to some elk tracks. Elk are principle prey for wolves, and Ray works out they are following the line of the snow melt. Suspecting that elk will lead him to the wolves, Ray and the team track down the herd and head for a meadow near the river. Ray soon spots that one of the elk is lame, which he knows make it a likely target for wolves. Sure enough, he soon finds the tracks of a wolf nearby. Ray has yet to find a wolf but while hunting he gets the sense he may be close. Seeking advice from wolf ecologist Curt Mack, Ray hears that Idaho’s wolf population was rescued from the brink of eradication in 1995, by an ambitious reintroduction programme. Thirty-five wolves were released back into the wild and there are now approximately 850 across the state. Ray asks Curt how it felt to release the wolves back into the wild. Ironically, the reintroduction has been so successful that the animals are soon to lose their protected status. The day Ray is due to finish filming is the same day wolf hunting becomes legal. Wolves hunt in packs and are such efficient killing machines that they have been demonised throughout history. But do they deserve such a bad reputation? One of Idaho’s biggest livestock farmers, John Falkner tells Ray that he respects the wolf, but his first priority is to protect his flock. Wolves do occasionally attack sheep, but Ray questions how a wolf can be expected to differentiate between them and other prey. At dawn the following day the team get a sighting at the meadow. There are a small group of wolves but they’re not hunting elk, they’re after rodents that are emerging from the snow. He then notices that one of the wolves is limping. Ray wants to find the whole pack and follows the tracks of the limping wolf in the hope that it will lead to a den. He finds blood in the trail, and wonders if there has been an injury or a kill. Ray meets local hunter Brett Wooley, who tells him that he was very against the reintroduction programme. Ray is deeply concerned to hear his views. Eventually, the team find the entire pack of about 12 wolves, that follow the lead of a silver backed alpha male. They discover that the alpha male is feeding on an old elk carcass that has recently thawed. Through the night, the alpha male and a young female wolf make several journeys up and down a steep cliff to where the den might be, presumably providing food for a breeding female. The following morning Isaac is devastated to discover the young female lying dead in the snow. The cause of death is unknown, although the team believe there is a possibility she may have been poisoned. On hearing the news Ray is visibly affected and becomes tearful. Worried that the rest of the pack might have eaten from the same source and have suffered the same fate, Ray leads the team on an urgent search. They search all the ‘wolf highways’ they know of, with a fine tooth comb and after several agonising hours, find a single fresh wolf print. Finally they have evidence that at least one wolf is still alive. After yet more searching they achieve another sighting of the wolves once again preying on rodents. Thankfully, the alpha male is alive too. It’s a huge relief for Ray and the whole team; an emotive finale that brings home the fragility of life, even for a top predator. This entry was posted in Ray Mears on April 28, 2010 by Woodlore Team. I am a lifelong nature-lover, hiker, amateur photographer, and a supporter of Wolf Haven in Tenino, WA. I was fortunate to see a lone wolf in Denali, AK and hear them in British Columbia, Canada. So, I was very disappointed by statements made in your documentary-drama about wolves in Idaho, which aired today (12/30/12) on PBS. You stated that right after the filming of your show, that anyone would be able to shoot a wolf, purposely ignoring the facts that licenses are required and wildlife management has limits on the number of wolves that can be hunted. Though I am not a hunter, I celebrate that fact that the wolf population has been allowed to return and thrive in Idaho. I would ask that you amend your show on wolves in Idaho to include a balanced update and interviews with knowledgeable fair-minded government officials and residents, and those who smartly promote practical measures being taken that protect both livestock and wolves. Shame on you for your blatant disregard for proper journalism. I challenge you to correct your films, make them current with an addendum, and send out the edited version to schools, libraries, public television shows, and regular consumers who were misled and had their emotions and intellect toyed with purposely. It’s fine to have a point of view, but please use your knowledge and passion for nature responsibly, fairly, and with a long-term view. AK has 7000 to 11000 wolves and they have never been listed as threatened or endangered. Wolves here feed mostly on Moose and Caribou or deer/goats in SE AK. Caribou require 20-25 percent calf survival for a herd to survive. In AK you can kill 5-10 wolves per year depending on location. Very few wolves are killed by hunters/trappers because it’s so difficult and the hides are not worth much anymore. Although wolves rarely attack humans now before firearms were invented attack was common. Thousands of people have been killed by wolves. Read up on Wikipedia if you don’t believe me. In France alone from 1580-1830, 3,069 people were killed by wolves. I have a deep respect for wolves and would never kill one but I am not against wolf population control. I think most Alaskan’s feel the same way. We don’t have much livestock up here so there is less hatred for Wolves. Ray, your videos and books are excellent. Keep up the good work and I hope I run into you on some ridge top someday. America is a very different place than the UK, and it shows it a number of your posts. The solution is there Annalena & Carl, with the livestock guardian dogs. When you have two or three of these dogs living with your sheep, the wolves go elsewhere to hunt. There are many different breeds; Anatolian Shepherd dogs, Pyrenean Mountain dogs, Kuvasz from Hungary, as mentioned before, Maremma Sheepdogs from Italy, Estrela Mountain dogs from Portugal and other breeds as well. Any excuse to hunt will do, it seems to me. We’ll keep slogging away with this. Just to add to my earlier message, I have taken a leaf out of Julie Norris’s book and have also written to the governer of Idaho expressing my horror at the hunting of the wolf. I have also written to Jim and Jamie Dutcher who spent six years living with these wolves (or at least their predecessors) studying their behaviour. Did anyone see the programme some years ago “Living with wolves”? This was the Sawtooth pack. I urge everyone to write to the goverenor of Idaho and to Jim and Jamie Dutcher. Just Google them and you will be able to e-mail them. They must be as horrified as we are. What a great episode this one was, we went from laughter to crying to being very angry and feeling completely helpless. Is there anything we can do to stop the killing of the wolves? Are there lists to sign or people we can contact? If farmers in that area would be helped by the local government to protect them and their live stock from the wolves, there wouldn’t be a need to kill them!? What about a project for helping them with fences and teaching them more about wolves’ behaviour? Maybe that would make them understand that a wolf doesn’t know the difference between live stock and prey! Thanks for all your comments. Unfortunately, neither Ray nor Woodlore were informed of the outcome of the possible poisoning; we’re trying to find out some more information on this from the production team at the moment. We’ll post it here if we manage to get some answers. I’ve long been an admirer of the wolf and I cannot understand why after the devastation of this animal in the past when they were in such danger of extinction, lessons have not been learnt. In the 1970’s livestock guardian dogs were imported from all over Europe into America (and other countries) to protect the sheep; this project was, and is, highly successful – I own such a breed of dog, the Maremma Sheepdog, and they are wonderful and fearless in their desire to protect. There is no excuse for hunting the wolf when this method can be used to protect livestock. Would be interested to know if the cause of death was established on the wolf; not sure if I missed that bit. Great series. Where can we see some of the images that you have taken of the bears and the wolves? Furthermore, we are just about to emigrate to Canada (BC) and wondered if you have any tips on how we can get to see some of the fantastic wildlife that you have brought to us through your TV series. Having watched this brilliant programme, I’m saddened to learn that the wolves are no longer protected and they can again be murdered. Surely after all the effects of the breeding programe and being released back into the wild more could be done to keep protecting them; we humans encroach on their land and wild animals are left to suffer our inability to live alongside them. Yes they may take a few sheep, but if farmers weren’t on their territory it would not happen. Humans are so quick to kill, the wolf is a beautiful, shy animal, and should be left in peace to live as wild spirits. I have contacted the Governor of Idaho to air my concern, not that I will get a reply!! I’m curious to know, what, if anything, gave Ray and others the strength to walk away knowing that the very wolves they watched were possibly being poisoned while they were visiting, and how did they leave knowing that hunters would probably kill the rest more for fun than any need. I found this a deeply sad episode as others must have too. Thanks ray and team – Fantastic programme tonight – but left us on a cliffhanger – why did the younger female drop dead so suddenly? Have the ranchers shot any wolves yet? Have the wolf cubs been seen around the den? I really enjoyed watching Ray track the wolves – they are without doubt one of my favourite animals. But I was absolutely furious with the ignorant people who expect wolves to differentiate between prey and livestock. Humans moved onto their land, their territory and we should move out if we can’t live alongside them in peace. I’m very keen to see these amazing animals protected from hunting. The whole programme reminds of the way European colonialism took over native American land and established a slow death for the indigenous people by creating a war and starving them by killing a major food source, buffalo. So what became of the pack following the change in the imperial corrupt laws they have, did Brett quench his redneck blood thirst? Just finished watching the final episode. WOW!! What an amazing animal. They are so beautiful and graceful. Why can’t humans leave such wonderful creatures to live their lives. Afterall, it’s our fault they come into contact with us, not theirs. Thank you Ray and crew for showing mankind just what great animals we have in our world. I only hope more people learn from your work, and leave these majestic animals to live their lives. Did you find out why the she-wolf died?